This article is about an enemy in Donkey Kong Country: Tropical Freeze. For a minor NPC from Super Paper Mario, see Harold (character). Harolds are enemies appearing in Donkey Kong Country: Tropical Freeze. 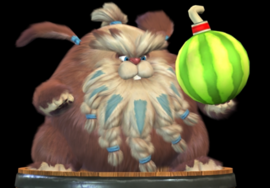 They resemble overweight hare-like members of the Snowmad army that make use of an unlimited supply of Watermelon Fuse Bombs. Each Harold has a rotund body and displays a viking-styled braided beard, with each knit featuring a painting of a sharp triangle that points towards the beard's end. The beard is grown around a small face, consisting of a round bunny snout over a tiny incisor tooth, a small red nose, and minuscule eyes under two bushy brows. A Harold's figure seems upset or maddened, as it characterises its temper. A Harold also features two distant ears, fastened with blue hair ties as if they were hair ponytails. On top of its head, also tightened with a tie, lies a splayed bun. Harolds are completely stationary, unlike most of the other Snowmad warriors. However, they might jump from time to time in an attempt to gain impulse. They proceed in tossing Watermelon Fuse Bombs at the player-controlled Kongs. Upon landing, these explosives remain on the ground until their fuses burn completely, after which they blow up; if the Kongs are not on time, they might get caught in the explosion and get damaged, resulting in the loss of one heart from the health meter. Nevertheless, the player can pick up the bombs and hurl them back at the Harold, as they go off instantly after hitting the enemy, which gets defeated thereafter and screams in agony while falling off-screen. This is not the only method of destroying a Harold, though; it can be rolled into three times or stomped onto the same amount of times in order to obtain the same result. This page was last edited on September 24, 2018, at 18:16.